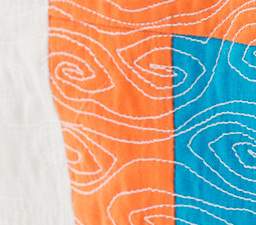 Tomorrow my super secret tutorial will be unveiled, all I can tell you is that it involves bright colours, a neutral traditional and modern piecing, free motion quilting and some stitchin’ in the ditch! This entry was posted in Tutorial by Tabatha. Bookmark the permalink. Love all those hot colours. Can’t wait to see what you create. Looking forward to it. I miss seeing your creative sewing/ designing!